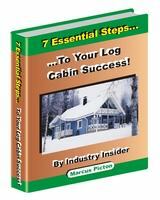 Log Cabins Canada & U.S. – why are some North American log cabins different? The Log Cabins Canada produces, have long been in demand in North America. There are also log cabin companies based in the U.S., but there is a lot of timber in Canada, hence a lot of log cabins come from here. With North America being such a vast area and very diverse in nature, so are the log cabins very varied and some quite different to anywhere else in the world. The log cabins in North America, really go back to the early settlers of the U.S. Many of the early pioneers used the timber they found locally, to craft the more rustic style log cabins. 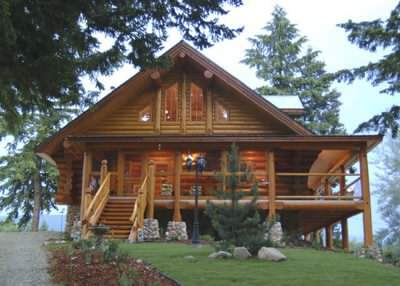 Still manufacturers of log cabins Canada and the U.S. make them in this very rustic and traditional way. The use of whole logs stripped of their bark, is unique to this part of the world and really creates some impressive and large log cabins. So which aspects of Log Cabins Canada and the U.S. are different? The type of logs that are the norm in Europe, would be referred to as machined or engineered logs here. Whilst you can find plenty of these in North America, it is the solid log cabins which really catch the eye in these parts! 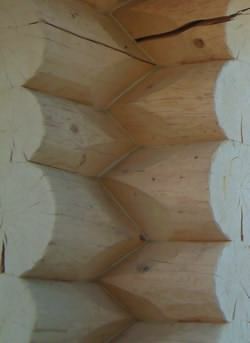 Created from whole logs (often of different diameters), the resultant structure is unique and very eye catching. These type of logs can often be expensive, due to the shear volume of timber (log widths can be huge), and the hand finished nature of the types of logs. It is a very traditional time honoured skill, but in the right hands can produce spectacular results! Discover more about all log types. Designs of the log cabins Canada and the U.S. produces, can vary wildly. You will find some of the most flamboyant and largest log cabins on earth here! There is often plenty of space in rural parts of North America, and being relatively new countries with quite relaxed planning policies, log cabins have been popular. Typically designs can be quite open plan (as is the norm for houses here) and of course the ranch style covered decks also make a common appearance. Discover more about the design influences here. 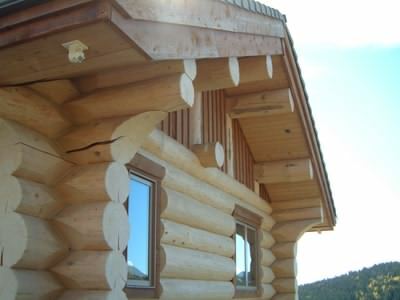 While for the engineered or machined style of log cabins, much the same maintenance rules apply, the solid log structures are a whole different ball game. If you are not familiar with the whole log style cabins then chinking and caulking, probably mean very little to you. However because of their very unique nature, these massive logs which are hand selected and scribed together by craftsmen, require regular and sometimes quite extensive maintenance. Unlike machined logs, which are all a regular size, with interlocking tongues and grooves and precision corner joints, these logs sit on top of each other and a good seal between them is vital. Weather also varies massively in this continent, so find out what maintenance requirements you will need to protect your investment.